Of all the bloggers, critics, entertainment journalists, gossip columnists, fashion commentators and bitter fanboys who spent the best part of last night live tweeting this year’s Academy Awards, none attracted as much attention as co-host and nominee James Franco. Franco, who’s long been steadily carving out a reputation as Hollywood’s finest multi-tasker, took things to another level by tweeting photo and video updates before, during and after the ceremony under the hash tag #OscarsRealTime. MTV have provided an exhaustive inventory of his updates throughout the day, from bleary wakeup call through makeup and rehearsals all the way onto the stage. In case anybody’s as curious as I was, judging by the photo above it looks as though Franco’s mobile device of choice is the iPhone 4. 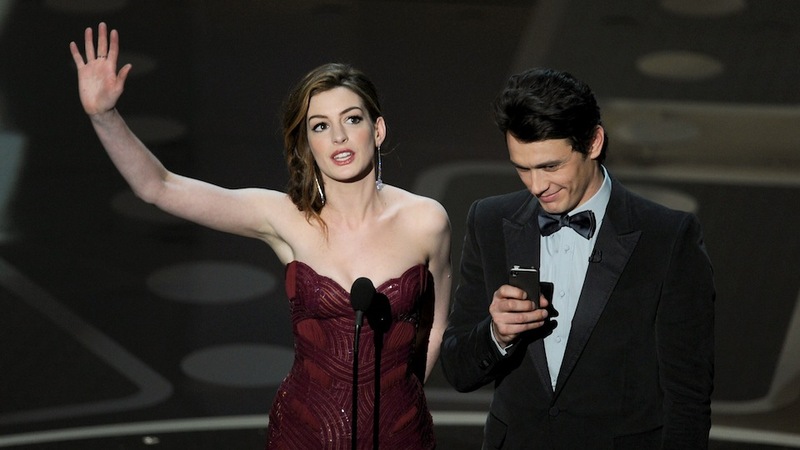 But given that he and co-host Anne Hathaway recieved what can only be called a mixed reception, with Franco in particular being variously described as “disengaged”, “sleepy”, and “apparently stoned”, there may be a valuable lesson here for any aspiring mobile journalists. In short, don’t talk and tweet. Joking aside, though, Franco has broken new ground here. Sharing candid, real-time updates from behind the scenes of Tinseltown’s most exclusive evening out is an unprecedented move, and might just herald a new era for the notoriously traditional Academy. This year’s ceremony was touted as “young, hip and edgy”, but the choices of winner were anything but – The King’s Speech winning out over The Social Network is the starkest possible example of rewarding convention over innovation. But Franco’s boundary-blurring went a long way to dragging the Oscars into the 21st century.